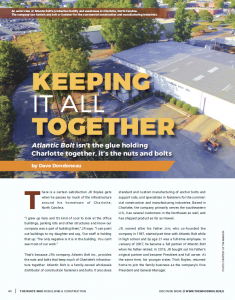 Atlantic Bolt carries many common sizes of regular weld studs (also called headed concrete anchors, shear connectors, and shear studs). Weld studs are placed in contact with a beam or other metal work plate, and welded into place using a hand tool called the Stud Gun. The Stud Gun draws a weld arc, melting the welding stud base and an area of the beam or other work plate. The weld stud is forced into the melted area and held in place until the metals re-solidify. This all occurs in just seconds. Our weld studs are domestically made and meet ASTM A108 and A496 specifications.